The Wild has made two moves prior to the deadline, and one came out of the blue because the price dropped dramatically. Buffalo Sabres GM Tim Murray, who had been trying to trade Chris Stewart all year long for a huge return, may have overreached at the end. The Wild was able to snag the power forward for a 2017 second-round pick. The Sabres are also picking up half the $465,000 still owed to the free-agent-to-be. Stewart is a gamble because his commitment, fitness, defensive reliability and work ethic have long been questioned. But when he is engaged, he is an absolute menace (listed at 6-2, 231 pounds) who can score and this is clearly a move to help the Wild compete in the playoffs against more rugged Western Conference teams. He scored 28 goals as a second-year winger for the Colorado Avalanche in 2009-10 and a combined 28 goals for Colorado and St. Louis in 2010-11, and it has been downhill ever since. This year, he has scored 11 goals and 25 points in 61 games and is minus-30, tied for second-worst in the NHL. Thirty-two of his 126 career goals have come on the power play. It'll be interesting to see if he plays the No. 1 unit because Thomas Vanek has had a propensity for turnovers, especially the past two games, on that unit. Stewart has 253 points and 510 penalty minutes in 443 games. Don't know yet who comes out of the lineup. We'll get GM Chuck Fletcher soon, but the fourth line is playing great (Justin Fontaine seems to make every line lately churn) and Jordan Schroeder has brought offense and speed and Sean Bergenheim has just been added to the lineup. So it'll be interesting how coach Mike Yeo proceeds with a lineup that is playing well, has been fast, hard-working and structured. Also, at some point, Matt Cooke, Ryan Carter and Jason Zucker should return. That's the risk with this trade: The coach may have to mess with four lines that have been going really well, which is a little surprising after Fletcher talked Saturday about not wanting to mess with the chemistry. TSN, funny enough, had Stewart ready to come on when the trade went down and broke the news to Stewart live on TV. His reaction: "The Minnesota Wild? Sounds good. ... I'm excited I'll get a chance to play in the playoffs. I had a rough start of the year, and I thought the last 30 games I definitely turned my game around. "They definitely have a lot of skill in their lineup, so me personally, I'd like to bring that power forward game, bring that grit and get in there, forecheck, create turnovers and just use my presence, go to the net, score some ugly goals." The Wild also acquired Leopold for a fifth-round pick and Justin Falk, whom sources say asked to be traded. Leopold was acquired from St. Louis for a 2016 fifth-round pick in November. Leopold, 34, is most importantly a left-shot that could bring depth in case of injury. Good vision, moves the puck well, suspect at times defensively, good locker-room guy and again would be a depth player to have around for a playoff run. He has scored 67 goals and 213 points in 677 games for seven teams (Calgary, Colorado, Florida, Pittsburgh, Buffalo, St. Louis and Columbus). The former Hobey Baker winner won a national title with the Gophers in 2002, scoring 20 goals and 48 points in 44 games. 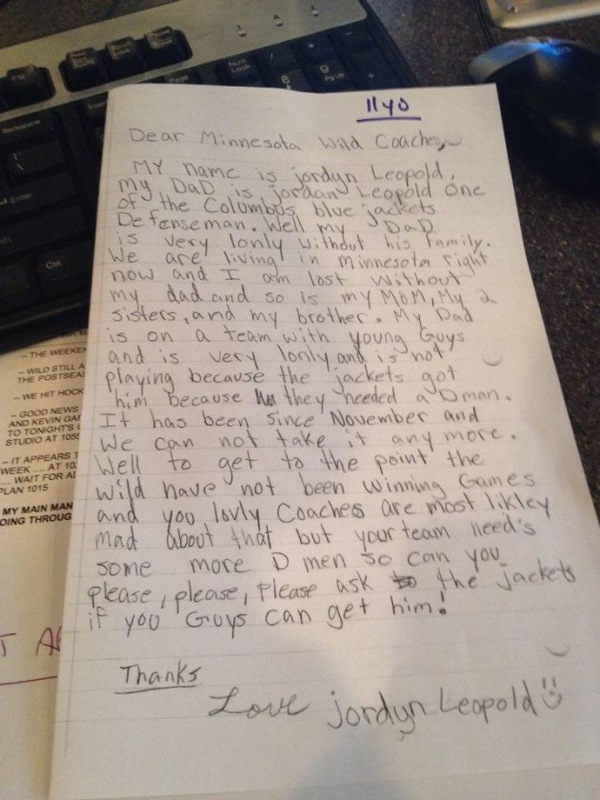 This letter is courtesy of KFAN's Paul Allen, who received this letter written by Leopold's 11-year-old daughter and read it on the air today. The Wild also made a minor-league move, sending 2011 first-round pick Zack Phillips to Boston for 2010 second-round pick Jared Knight. Phillips flamed out bigtime and was a source of much frustration for the Wild because he had all the skill without the commitment off the ice. Once in Calgary, Todd Richards pulled a phone out of his practice garb and pulled Eric Belanger off the ice for his trade to Washington. Coach Mike Yeo said he didn't bring his phone on the ice today. Yeo on the trade deadline: "Boring for us. I went into this day understanding and knowing – obviously things could change, but first off we like the team, we like the way that we’re playing right now – a lot of the moves that we’ve done, we did them early. You look at Duby (Devan Dubnyk), it speaks for itself what a good deal that was for our team. You look at Sean [Bergenheim], the two games that we’ve seen him, we’ve been very pleased with what he’s brought. Also looks like a good fit." On the possibility of trading for a depth defenseman, Yeo said, "[Fletcher] has our support on that. That’s not because of the play because of the guys that are in the lineup right now. We’ve been very pleased with that group (Nate Prosser, Matt Dumba and Christian Folin) and what they’ve been doing and the progress of our young kids. But that said, you have to prepare for injuries and make sure you’re protected that way. We would welcome anything like that." Stephane Veilleux was assigned to AHL Iowa to create two roster spots. Also, injured defenseman Marco Scandella and Jared Spurgeon didn't practice this morning. Everybody else did. Yeo said there was good news with Scandella and there's nothing structural with this undisclosed injury and nothing to worry about. He said Scandella is feeling better and Yeo is "optimistic" he can play Tuesday against red-hot Ottawa. Also, defenseman Jared Spurgeon will miss his sixth straight game with what's believed to be a concussion, but he skated this morning, is feeling better and the hope is he can return Thursday in Washington. Also, the NHL will announce today the Colorado fines for Patrick Roy, Gabriel Landeskog and Cody McLeod. The Landeskog and McLeod fines will seem insignificant, but remember, there is a maximum players can be fined under the collective bargaining agreement. A non-repeat offender with no hearing can be fined half of one day's pay not to exceed $5,000. So the fines are to bring attention to the rest of the NHL that the incidents were unacceptable and to establish a history with the players for future potential discipline wrongdoings. Kyle Brodziak on McLeod jumping Mikael Granlund with three seconds left in a 3-1 defeat: "Clearly frustration or somebody told him to go do that because there's no point. What did Granny do? Just shows no class and lack of emotional control or whatever it is." Koivu didn't bite talking about Landeskog, saying it is what it is and part of hockey and an emotional game. Yeo on Dubnyk winning NHL First Star of the Month: "Very pleased for him that he could accomplish that. We’ve benefited from his solid play along the way. Very deserving of it. Anytime any player wins any kind of award and gets any kind of recognition like that, there’s a lot of people that helped him along the way. Certainly I think the team and the game they’ve played in front of him deserves a lot of credit for that. But there’s no doubt he’s very deserving and we’re all very happy for him." Dubnyk also credited the team and was very honored. I'll be back if there's a trade or after the deadline. Russo: Digesting the deals. What will the Wild's lines look like?